This crochet dish cloth has a lot of open lace, so it’s more of a doily. It works up quick and easy and makes for a great gift to go in a spa set or as part of a housewarming gift. For this design I used a cotton yarn, but any similar worsted weight yarn will work just as well. 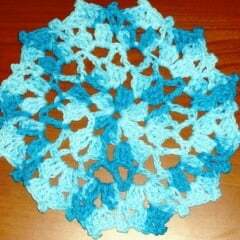 If you like doilies, you might also enjoy this doily, or this snowflake table runner. For dishcloths, check out this star dish dishcloth, which can also be used as a small doily. Gauge: Round 1 measures 2.5 inches across dc sts, and 3 inches across from loop to loop. Finished Size: 10 inches in diameter at the widest points, & 9 inches in diameter at narrow points. Beg Shell: (Ch 3, 2 dc, ch 3, 3 dc) all in loop. Shell: (3 dc, ch 3, 3 dc) all in loop. Rnd 2: Sl st into next 2 dc and into next ch-3 lp, work beg shell in lp, ch 3, (shell in next lp, ch 3) 5 times. Join with sl st.
Rnd 3: Sl st in next 2 dc and in first lp, ch 6, (counts as dc and ch 3) dc in same lp, (tr, ch 3, tr) in next lp. *(dc, ch 3, dc) in next lp, (tr, ch 3, tr) in next lp*. Rep from * to * 4 times. Join with sl st in 3rd ch of first 6 ch. Rnd 4: Sl st into lp, work beg shell in ch 3 lp, work shell in each ch 3 lp all around. Join with sl st in top of first ch 3. (12 shells). Rnd 5: Sl st in next 2 dc and into lp, ch 3 (counts as first dc), 2 dc in same lp, ch 3, sl st in 3rd ch from hook, 3 dc in same lp, *skip next 3 dc, (dc, ch 3, sl st in 3rd ch from hook, dc) in sp before next 3 dc**, (3 dc, ch 3, sl st in 3rd ch from hook, 3 dc) in lp of next shell. Rep from * around ending at **. Join with sl st in top of first dc. FO.